We Will Remain - Patriotic Songs of Newfoundland, is an audio journey that represents over a century of song, music, oration and prose that explore our national consciousness. Twenty of Newfoundland's artistic talents have combined their skills and passion to record an album that actively pursues the question of identity. We Will Remain maps the path that has led to our current political and economic circumstances, from a declaration of independence, through the confederation debates to the present deliberation of promises and realities as a result of confederation. The album is a proclamation of existence and an energetic celebration of some of the features that characterize Newfoundland's individuality. It consciously provokes both an intellectual and emotional response from its audience. We Will Remain - Patriotic Songs of Newfoundland is the brainchild of Executive Producing brothers Steve and Paul Delaney. Produced by Jason Whelan of The Sound Solution, We Will Remain - Patriotic Songs of Newfoundland boasts a stellar line up of Newfoundland artists including ECMA nominees Fergus O'Byrne and Jim Payne, Cory Tetford, Jim Joyce, Jean Hewson, Tommy Nemec and Glenn Hiscock among others. The album opens with a unique rendition of The Ode to Newfoundland, performed by Jane Moran and Michele Smith to music by Sir Charles Hutton. It includes songs from the Confederation debates of the last century, as well as excerpts from speeches made by some of the major proponents of Newfoundland independence in this century. It features original songs by Ron Hynes, Sean McCann, Bob Hallett and David Benson, and is completed by a stirring recitation, We Will Remain, written and performed by Shane Mahoney. 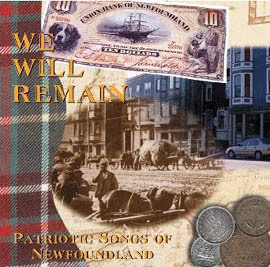 We Will Remain - Patriotic Songs of Newfoundland was released on the SingSong Inc. label on March 31st, 1998, the 49th anniversary of Newfoundland's entry into the Canadian federation. For further information please contact: Steve Delaney or Jim Payne at SingSong Inc.